Bajalia, a hand-crafted artisan jewelry line, will be coming to HSN March 8, the home shopping channel said Friday. The concept behind Bajalia is a noble one: CEO and founder Debbie Farah uses her design skills to provide business opportunities for disadvantaged women. The lines debut will coincide with the 100th anniversary of International Women’s Day. The launch of the Bajalia brand on HSN is a collaborative effort between for-profit and non-profit corporations. Through Bajalia, Farah has developed a worldwide network of social entrepreneurs to help create jobs for women in shelters designed to provide counseling, medical care, literacy and job training. Of course, HSN chimed in. Drawing upon 28 years of experience in advertising, design and product development for major retailers such as Neiman Marcus, Macy’s and Bloomingdale’s, Farah has developed and chose an ve assortment of beautifully crafted pieces to debut in March. Indigenous design elements include vibrant gemstones such as turquoise, coral, amber and lapis mixed with glass, paper and various gold and silver toned metals. Bahkt Nazira – Afghanistan: Facing scarce economic opportunities and safety concerns, Bahkt Nazira developed her own fashion line. She transitioned from being unemployed and uneducated in business to being the primary support for her family and a force of change in her community. She has now learned to speak English, runs her own company and helped her husband launch another business. India: Asala is a 27 year-old entrepreneur who produces semi-precious stone jewelry. A homeless child, Asala was taught the craft of making stone jewelry by an artisan associated with Bajalia. Thanks to regular work and fair wages, in 2008 she was able to pay for and move into a small one-room kitchen flat. Today, she is the main wage earner for her family. India: Moofees is a 45-year-old skilled artisan living in Agra who develops samples and trains other artisans. Deserted by her husband nine years ago, she trained herself in embroidery, created her own business, and is now the sole provider for her two sons and five daughters. Two of her daughters are now receiving educational grants from a non-profit partner in India. India: Shabnami is a 37-year-old mother of six children. Despite limited educational training, she has assisted her husband in overseeing the finances of his jewelry business and helped with the production of beaded jewelry by working with women in her neighborhood. The Bajalia collection will feature a variety of styles and designs, ranging in price from $19.95 for oblong paper bead earrings to $199.95 for a silvertone glass bead horn necklace and earrings. Headquartered in Winter Park, Fla., Bajalia was founded in 2003 by Farah. Bajalia’s mission is to alleviate poverty and empower low-income people around the world through trade, training and other forms of community development and marketing their products to bring about sustainable, empowering, change in their lives. Bajalia is a leader within the emerging social enterprise movement. Bajalia, through collaboration with its non-profit sister organization works intimately with its production network to help them manage their growing enterprises, hire and empower more women and focus on education, economic development and long-term sustainability. Through its first retail location in Winter Park, Fla., its Web presence and its strategic distribution networks in the U.S. and Europe, Bajalia allows artisans to operate on a scale of production that they could not attain by themselves, marketing together globally. In doing so, the producers are empowered to replicate themselves and to bring transformation to their communities. 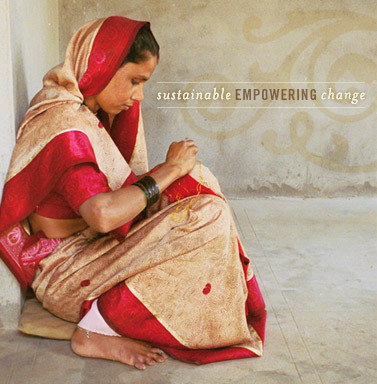 Bajalia’s collaborative partners globally include US AID, BPeace (Business Council for Peace), Aid to Artisans, SEWA, India, Export Promotion Council for Handcrafts (EPCH), India, and Center for Advanced Entrepreneurship at Rollins College. You are currently browsing the archives for the Bajalia category.